the color of burnt iron, a darkness alcohol finally brings. where he could get the money to pay me back. You know me. You must want to care for me. I think I gave him something, not much, and drove away. that brings such desolation you can’t survive. for the last time, and they pick him up. of your dress. I am always surprised to see you. you will disappear in a startle of color. of light explicit as a summer evening. Deer quietly chewing. I balance, in the shadows, between. That is easily my favorite Herb Scott poem; it is the one, when asked, or when I think of him, that I turn to. 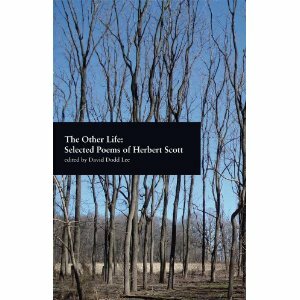 My first exposure to him was through The Other Life: Selected Poems of Herbert Scott, edited by David Dodd Lee. I devoured this book upon its purchase, and read it again and again, before entering the MFA program at Western Michigan University. Since attending WMU, and volunteering and working at New Issues Poetry and Prose, I have realized the impact one poet can have on a literary community: the friendships, the press, the poetry, sharing the word; he was one of the hinges on which everything ran. I never met him, but my praise for New Issues is never-ending, and his poetry continues to startle me. He challenges me as a poet, and as a member in this community; it’s a gift I wish for all other poets, all other writers, as long as there are literary communities. Herb, today would have been your 84th birthday. It’ll never be enough, but I like to think turning to your work, raising a glass of white wine, and thinking about what I can do in the literary communities I touch to make them better, I’ll be able to do a fraction of what you’ve done, and continue to do. Happy Birthday, and happy memories. Cheers. Previous Tomorrow!! At the Kalamazoo Institute of the Arts! !